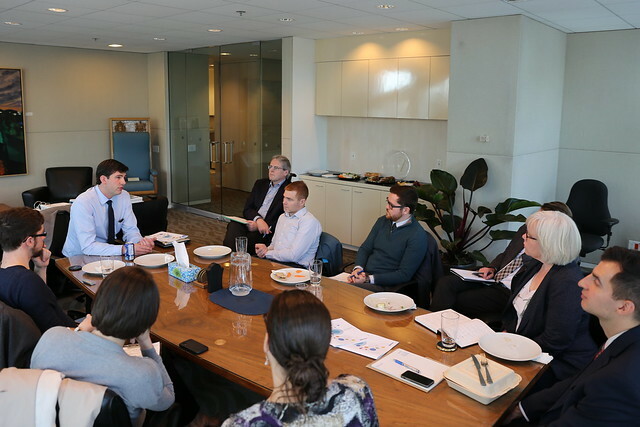 On Monday, Mayor Iveson held a lunchtime “editorial board” at his office for some local bloggers. He seemed energized and excited to talk about the budget, even though he was in the middle of a day-long public hearing and barely had time to eat. Given the limited time we had available, we didn’t cover as much as I would have liked, but we did get to hear from the mayor on some important budget-related topics. Here are some that I wanted to highlight. Describing the budget as “by far the most complex piece of governing that we do,” Mayor Iveson said he was pleased with the attempts this year to demystify it for Edmontonians. He cited the new City Budget microsite and the associated PDF primer as two positive examples of a different approach to getting budget information to citizens. He also mentioned the Reddit AMA with CFO Lorna Rosen. I thought that was a great initiative, but there weren’t as many questions as I expected. I asked Mayor Iveson what the City can do to increase the budget literacy so that people feel empowered to ask more meaningful questions. “How do you usefully simplify 600 pages of information into a high level, ‘where does the money go?’,” he asked rhetorically. “People have every right to say, ‘where does this money go'” but he noted that it’s certainly not an easy process. One positive example was the Edmonton Insight Community, which serves as an educational tool as much as an input tool. More than 800 Edmontonians spent an average of 24 minutes using the interactive tool that was part of the Edmonton Insight Community survey on the budget. “I think we could go one step further in the future, with an interactive website,” he added. The mayor envisions being able to put in your tax roll and see how your contribution breaks down by department. He says Edmontonians would be pleasantly surprised to see that the City does indeed spend the bulk of its money on the things that citizens say are important to them. 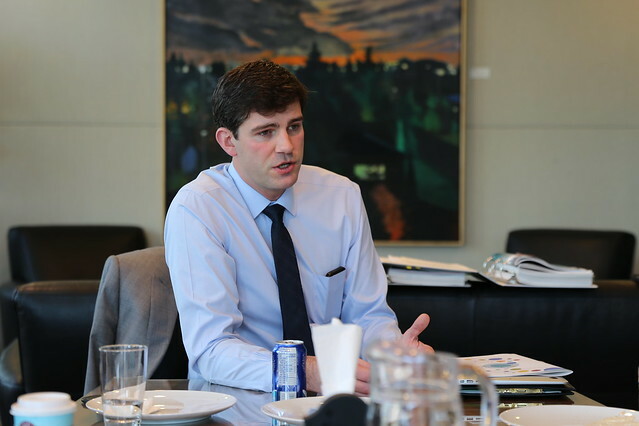 During the election, Mayor Iveson proposed a new program called “Council’s 2%” that would require City Administration to find about 2% in increased efficiency every year. The goal would be to take the roughly $20 million saved per year and invest that into either infrastructure improvements or other innovative ideas. It’s a culture change, from what Mayor Iveson calls “pin the tail on the budget” to interactions based on trust. “We trust our staff to do the right thing if they are given the right incentives and given the right recognition for doing the right thing.” Instead of padding the budget because they think Council will just try to cut a few million, the goal is to have Administration put forward the most realistic figures they can. Mayor Iveson explained that a tiny change in assumptions can often translate into millions of dollars in the budget. Over time, that trust could translate into greater acceptance by Council of ideas brought forward by Administration, where as previous Councils would have remained skeptical. So while the City is off to a good start with Council’s 2%, there’s still a lot of work to be done. “It’s a term-long project to instill that culture,” Mayor Iveson said. The mayor made his case for receiving a bigger piece of the pie. Or as he put it, “some equity in consideration of the fact that we are a hub for northern Alberta.” Though he did talk briefly about the importance of having stable funding for and “line of sight” on big infrastructure projects like LRT expansion and improvements to the Yellowhead, the mayor focused more on working with the Province in his comments. Mayor Iveson lamented the fact that Family and Community Support Services (FCSS) funding has not been increased in quite some time, and said “if we don’t deal with some of those things proactively they can become policing challenges, which is the most expensive thing we do.” He talked about preventing people from needing to access health care, as an example, which is a big piece of the provincial budget. “I’m less interested in just getting the Province to just pay for a whole bunch more cops,” he said. “What I’m really interested in is getting the Province to fund FCSS.” It’s about working together on prevention. The general sentiment he’s hearing is that people are fine with paying a little bit more in tax now because they see things changing. They see neighbourhoods getting reconstructed, and they see potholes getting filled, they see roads being improved. Though he has previously suggested there might be light at the end of the tunnel for those looking for a tax break, the mayor clarified that comment. “The neighbourhood renewal levy will be fully funded on an ongoing revolving basis as of about 2018,” he told us. So you can count on that 1.5% tax levy for at least the next four years. I was very glad to have some time to hear directly from Mayor Iveson on the budget. It’s great to see that he is willing to reach out to bloggers and other social media folks, too. Budget discussions continue at City Hall for the next couple of weeks, and you can find all the relevant information here.